For the past few days, heavy rainfall has poured due to a low pressure area. 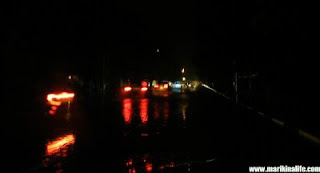 Unfortunately, some roads in San Roque intersecting Gil Fernando Ave and some backroads in San Roque, have experienced partial flooding, inlcluding Redwood (near Metrobank), Dasdasan (near Biksa Coffee) and Bangkilya roads within the residential areas. Sumulong Highway is also experiencing some flash flooding in front of the Marikina Valley Medical Center and in front of the area where Toledo Towers is soon to rise. The flooding area incidentally is the same area which has just been asphalted a few months ago. 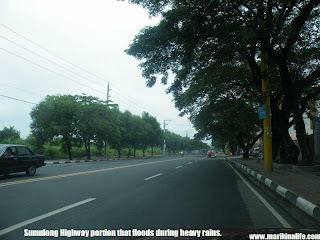 Fortunately, I've seen signs along that area with a picture of Congressman Marcy, stating that he will be spearheading a project to improve drainage and road condition of Sumulong Highway. Let's hope that this can be done before the rainy season begins to avoid flash flooding along Sumulong Highway.